Since 2009, the Bank of England has been authorized to create £375bn of assets by the creation of central bank reserves. 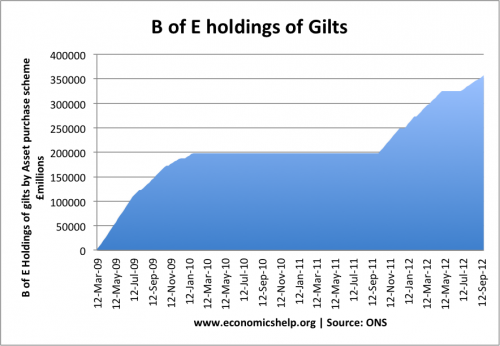 This new money has been used to purchase government gilts. 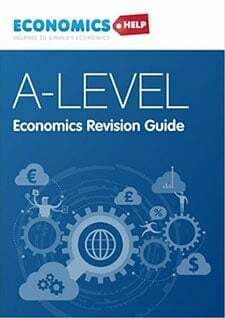 The theory is that by creating extra money and buying gilts from financial institutions, there would be an increase in the money supply and increase economic activity. Banks would have more liquidity because they have sold gilts to the Bank of England and received cash instead. 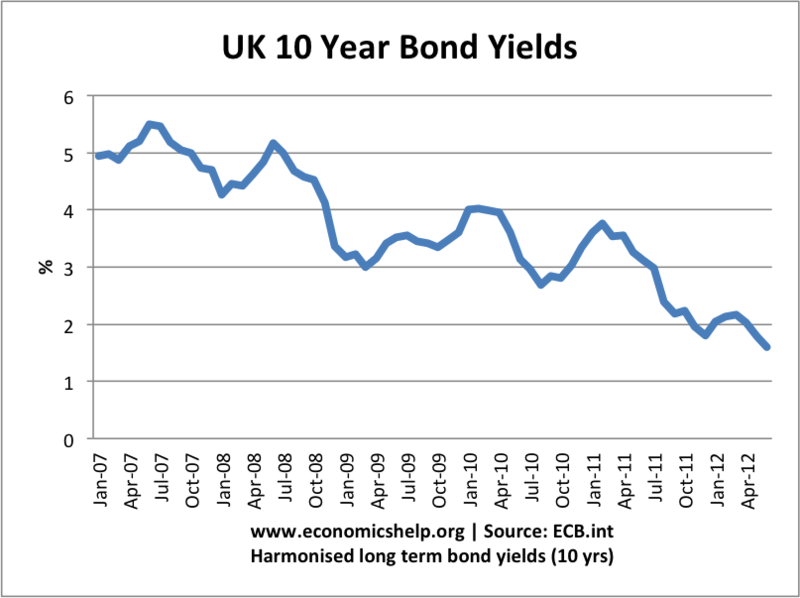 Falling bond yields helped by quantitative easing, but also diminishing prospects for economic growth. 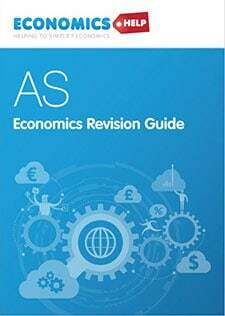 Secondly the asset purchase scheme was intended to reduce bond yields on government gilts. With lower interest rates on bonds, banks have more incentive to lend money on more profitable investments. However, despite falling bond yields, and a rapid growth in the Bank of England’s balance sheet as it purchases more government gilts, we have seen a fall in the broad money supply. 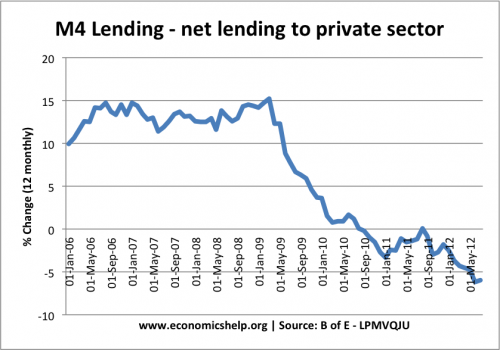 M4 lending falling 6% in the past 12 months. “Four in 10 small firms were refused [bank credit] in the second quarter and this needs to change if the economy is to grow. 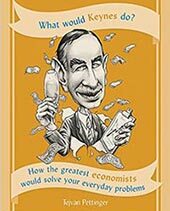 The implication is that in a liquidity trap and depressed money, creating money does not necessarily lead to a growth in the money supply and inflationary pressures as classical theory may predict. In short, banks may have greater liquidity but they haven’t been lending this extra money to business. Banks feel in the current economic climate, any private sector business lending is risky. Consumer demand is weak, therefore banks are taking this opportunity to improve their balance sheets rather than increase lending. Does this mean Quantitative Easing has been a Failure? It is hard to quantify. Without quantitative easing, there may have been a bigger fall in money supply and an even deeper recession. The fall in money supply and bank lending shows the extent of the adverse economic situation as a result of the overhang from the financial crisis. 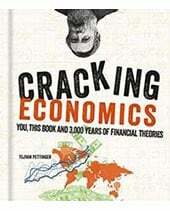 It also shows the limitation of this particular form of unorthodox monetary policy. The current problem with quantitative easing is that the government can’t force banks to lend to the private sector. However, the government are concerned that lack of finance is still holding bank business from investment. Therefore, there have been proposals for a government bank to lend directly to firms and bypass commercial banks. 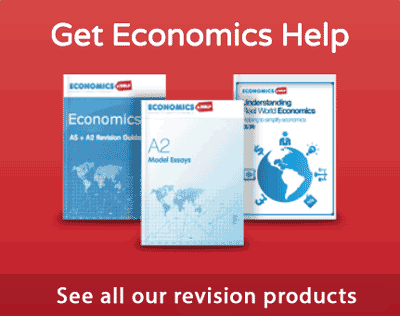 This entry was posted in economics and tagged money supply, quantitative easing. Bookmark the permalink.